a. Mixture of European and American Indian. b. As part of the Federal Republic of Central America. Honduras is a country in Central America. Its capital is Tegucigalpa. Most people of Honduras speak the Spanish language. 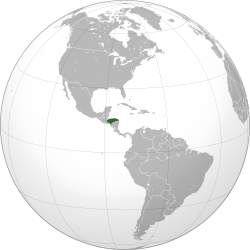 7,483,763 people live in Honduras and it is 112,492 square kilometres (43,433 sq mi) in size. It is next to El Salvador. To one side is the Caribbean Sea and to the other in the Pacific Ocean. The ethnic makeup of Honduras is 80% mestizo, 17% amerindian, 2% black, and 1% white. Honduras is divided into 18 departments. The capital city is Tegucigalpa in the Central District. ↑ 2.0 2.1 2.2 2.3 "Honduras". International Monetary Fund. http://www.imf.org/external/pubs/ft/weo/2014/01/weodata/weorept.aspx?sy=2012&ey=2019&scsm=1&ssd=1&sort=country&ds=.&br=1&pr1.x=55&pr1.y=10&c=268&s=NGDPD%2CNGDPDPC%2CPPPGDP%2CPPPPC&grp=0&a=. Retrieved 18 October 2014. ↑ 1992–2007: "Human Development Report 2009 – M Economy and inequality – Gini index". Human Development Report Office, United Nations Development Programme. Archived from the original on 17 October 2009. http://hdrstats.undp.org/en/indicators/161.html. Retrieved 17 October 2009. This page was last changed on 31 January 2015, at 09:25.